Photo: Jon Masters, as Thomas Paine. 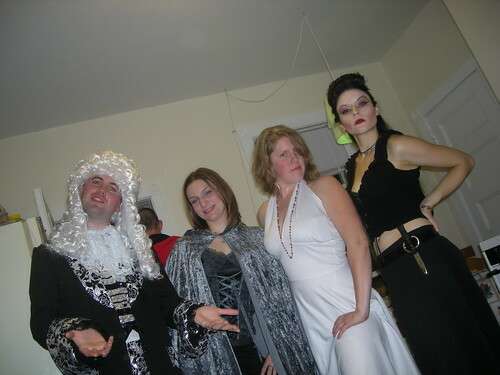 So Ginger and Grace had a Halloween Party and Housewarming. 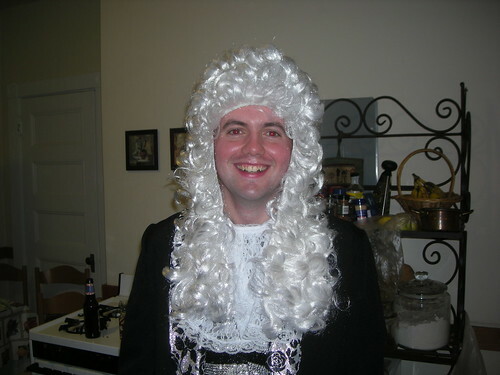 I obviously had to go as Thomas Paine, since one can only be British in this town for just so long before breaking out the historical character costume. Photo: The gang’s all here. From Romans to Colonials, to Actresses. 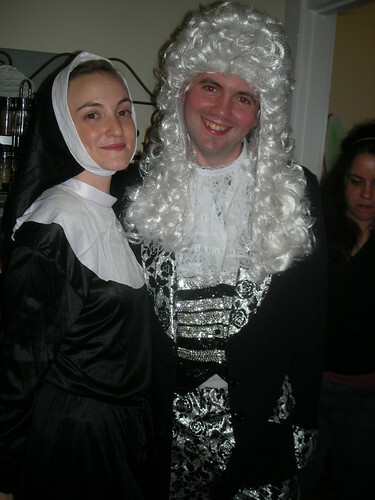 Photo: A nun and a historical figure. I spent the evening catching up with a few folks from out of town (out of country). Pretty soon, the conversation turned to the US – as such gatherings may have a tendency so to do – and the ranting started very soon thereafter. I found myself defending the US at some length, and I now also want to take this opportunity to profoundly apologize for many things I’ve said in the past. The fact is, the US has many problems. But so does *every* country on the planet. The US has many of them, because it’s the same size as Europe. Another thing I object to is the belief that the US is much worse on the immigration front than say, the UK, or Germany. It’s true that immigration policies are broken, and there are many issues, but Just because you’re from Europe – and so don’t get treated like a foreigner at the border – doesn’t mean that Europe doesn’t have many of the same issues, you just don’t see them if you live there. They are not going to give you 20 questions at your own border. They don’t want you to see their dirty laundry. Sheesh. I guess I’m admitting to my historical hypocrisy in standing up for this great nation, founded by some great men (many of whom we have turned our backs on since). Yes, it’ll be even greater when GWB is out of office, when healthcare and eduction are given the importance they should have (compared with war), but these things will take time. And it’s wrong to say people don’t care. The truth is, people care very much. If you want to criticize the US, but have no interest in ever living here, ask yourself if you’re really qualified to make that call. I do criticize the US, and I do criticize the UK, but I *have* lived in both countries, and I live here now, so I am in a position to have a founded opinion. So, it’s been a while since I wrote an update on project Brave New Jon. I thought I might share some news about my diet, since I’m not sleeping at 5am in the morning and can only read NDBC raw buoy data for so long, after long since giving up on the counting of sheep. Firstly, project Brave New Jon is not dead, but has merely transitioned into a longer term sustaining role now that I am done with its initial raison d’etre – it started out as a giant pining exercise, the most elaborate and ridiculous that I’ve ever managed, all over a girl (as many things are). People who know me well know that I was almost indescribably upset, serving as an impetus to do such things as learning to drive in the US within a week, taking up surfing, spending many consecutive weekends traveling to remote parts of California to be alone, that kind of thing. Oh, and buying a car. I’m most grateful to her for that final point – I wouldn’t have blown so much on a car otherwise. Anyway. History lesson done, and I’ve been keeping my diet going. I am now 45 lbs lighter than I was in March (I gained a little, briefly, over the summer through excessive consumption of nuts), and have just 15 lbs to go – just over a stone (an antiquated and pointless unit of weight used by the British, and the source of the pun used in the title, in case you enjoy having the punch line explained). I am specifically aiming to be exactly 6lbs under my ideal weight, briefly, so that I can be technically referred to as “that thin guy”, at least technically. I am achieving this without starving myself, purely through carefully contrived controls and sheer willpower – I haven’t eaten any cheese, desert, chocolate, or anything remotely unhealthy since March. I ensure that I have 100% of my RDA values of all vitamins, minerals, protein, etc. but I eat mostly salads, soups, and lighter meals. Being semi-vegetarian certainly helps (technically, I’m a pescetarian, since I eat fish/sea food). It feels good. Longer term, I’m shooting for exactly 11 stone, or 154lbs. This is on the lower end of my ideal weight, but we all know what happens when we let life intercede with our diets…so I expect a little hysteresis to occur as an alternative to constant hunting iteration. When I said I was no longer the person I used to be – I literally meant what I said. I’ve been the fat geek type, I’ve been the not so fat geek type, and now I’m interested in being the geek with a six pack. Or at least look good in my wet suit. I’m under a 30″ waist at this point. Facebook readers can follow along with My Diet updates. Don’t ask. It makes the $3,400 I pay each year for auto insurance look pretty good. But it does afford me the ability to randomly drive up to Salem in the middle of the night, like I did last night, for no reason.
. I’m bored. It’s 5am, and I just spent an hour reading through the most dry and boring technical material NOAA and NDBC have to offer, and still couldn’t fall asleep. So, forgive me, that’s an electronics joke, he says, yet again explaining the source of his jokes. Electronic systems frequently make use of hysteresis levels to avoid hunting between various bounded values. You rely on this principle all the time. So, I was at an Arrogant Worms gig in the UK a year or maybe two back, and I asked them to play the “Canadian Crisis Song”. A joke track in part about the devaluing of the US dollar compared to the Canadian (also the GST, various other issues that you won’t care about if you don’t follow Canadian politics). Anyway, this song was popular half a decade ago. They said they don’t play it, because the economic situation isn’t quite what it was when they used to play that…well, times change. Thanks to GWB, and his cronies, I can once again play The Canadian Crisis Song, and it has some meaning. This Administration has done so much to ruin this country’s economy that the phrase “with friends like these, who needs enemies” certainly comes to mind…regularly. Anyway, an excuse to play random Worm’s tracks was vaguely good and useful, because I just spent a few hours pulling tracks off an old iPod, using a nasty little script (had to pull via unpowered USB, since the new firewire stack is so fantastically awesomely better than the old one that it won’t see this iPod at all), so I could charge it for a few minutes at a time. Oh the fun one can have at 5am. I could sleep. Or I could rant more. Wow. Stephen Colbert just announced (at approximately 11:36pm EDT tonight) that he is running for the office of the President of the United States. One of the things that constantly bewilders me is the fascination people have with a fundamentally flawed “healthcare” system that exists in this country. It’s widely known that US healthcare is unfair, unbalanced, biased, and generally not up to the level that people would like to think of it. But this isn’t a sociali[sz]ed medicine rant. I’ll save my ranting about how many poor people (including children, thanks to GWB) must suffer at the hands of the haves, because nobody wants to pay just a little bit more tax for a system that is actually fair (I believe in capitalism, but capitalism that works – i.e. everyone gets education and healthcare on some basic level without having to go begging), for another day. Nobody listens to my arguments anyway. This is a rant about the healthcare industry. You know, the one that owns TV advertising. The one that would sell its own grandmother just to make a fast buck…”selling your own grandmother isn’t for everyone, my doctor says I should”…yada yada yada. Every ten minutes. They annoy me trying to convince me that I need medication that I don’t, then they get upset when they have to settle record lawsuits with people who bought what they said. I don’t expect them to be impartial, nor do I expect many US doctors to offer entirely impartial advice (not with how they are funded), but I would like there to be some balls to organizations supposedly overseeing this little circus, worth billions annually. It’s so frustrating. You know what really pisses me off even more? Seeing commercials for big-pharma and how it’s helping people get more access to medication. No it’s not. Big pharma doesn’t want social medicine, or any of the alternatives, if it can ever possibly avoid having it. So they plough just enough money into (good for PR…and great for TV advertising) campaigns to plug enough of the problem that the masses will think they’re doing everyone a favor. It’s extremely disturbing. In many countries, such practices might get called out for what they really are – and certainly a lot of the TV commercials I see would likely be banned under various false-advertising legislation. So it’s been lagging out for a while, but I finally got around to finishing the Xen upgrades to panic. panic.printk.net is now running Debian etch with the best Xen-enabled kernel anywhere…built straight from RHEL5 kernel sources. We first installed dmesg.printk.net back in college (or, University, to UK folks), and it’s served us well over the years, but after a hardware glitch a few years ago, we procured panic.printk.net as a backup. These days, it’s a little overkill having two machines (we’re all doing different things, so we have other options for backup), but we’re keeping them both around for the moment. Well, until Xen is ready. I started poking at Xen back in July, building up a hypervisor and kernel based on the excellent RHEL5 public kernel sources (the box in question has been running Debian since long before I was actively developing for RHEL), but building said kernel on a (old, and bitrotten) Debian box demonstrated why I hate building toolchains, and why developers shouldn’t have to be experts in building tools just to build this kind of stuff. I wound up building the kernel on a box running a distribution substantially similar to RHEL, before copying over. * Xen’s broken “configuration” process, it’s a joke. * Optimal process for trying every non-working PAE/SMP config pairing. * Netlink socket problems, module issues, a few kernel glitches. Eventually, I have a reasonably stable Xen setup running on an old box, which should allow us to now begin working on a variety of interesting stuff. All this means that I can finally fix various mailing lists, websites, and other things that have been awaiting the completion of this little endeavor. Right now, oops.printk.net, testing.printk.net, dmesg2.printk.net, and (occasionlly), crash.printk.net, are online for our use. P.S. I’m not completely living under a rock. I just built a new KVM-based AMD system for virt. experimentation/testing at home. Using it to do all kinds of cross-distribution testing, development, and RHEL development.